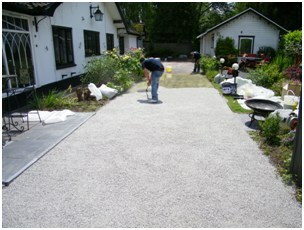 Styleseal were commissioned to provide a solution for the improvement of appearance of an old tired concrete driveway with a low cost treatment without the added inconvenience of breaking up of the original surface. Having carefully inspected the existing surface we carried a thorough preparation which included a meticulous power wash and weed killing treatment followed by a seal coat and void filling application. 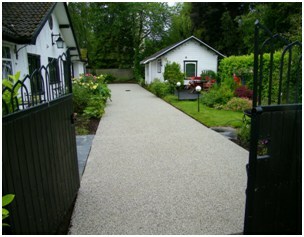 Once all the remedial and preparatory work was complete the surface was ready to be transformed with a new resin bonded aggregate application. The client chose a silver grey granite 1-3mm applied to a BBA approved resin for a fantastic appearance and excellent longevity. Styleseal’s dedicated installation team carried out the entire project over a two day period including all preparation and surface application. Once complete the entire driveway was swept and all the edges were squared off to give sharp lines and contemporary feel to the installation. The end result was a completely transformed driveway perfectly complementing the property and providing a pleasant contrast to the slate patio adjacent to the new resin bonded surface. 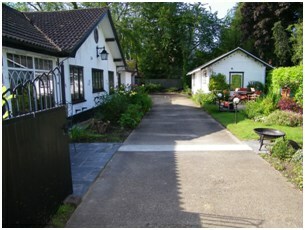 This driveway will give years of service and has given this property renewed kerb appeal.